Chow Down with the Barrio Homies :: Tucson, Az. “Best of the Barrio Culinary Tour“, where you’ll sample the cuisine of South Tucson’s historic Barrio neighborhood via an air-conditioned Gray Line bus. This four-hour “Best of the Barrio” gastronomic tour includes stops at five of Tucson’s finest family-owned, off-the-beaten-path eateries. 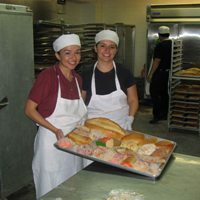 Sightseers will find handmade pastries and tortillas at La Estrella Bakery, traditional Sonoran-style Mexican entrees at Micha’s, ceviche and fish tacos at Rodriguez Fish Company, Sonoran hot dogs and carne-asada burritos at El Guero Canelo, and, finally, “raspados” (shaved ice, ice cream, fresh fruit) at Oasis Fruit Cones. Cost is $85 per adult for tour and food. I’m thinking that getting in a day early to explore the local Sonoran food scene at these small family-owned operations, makes perfect sense before spa-ing it. P.s. I love their Note: “It is recommended that you eat very little prior to taking this tour”.